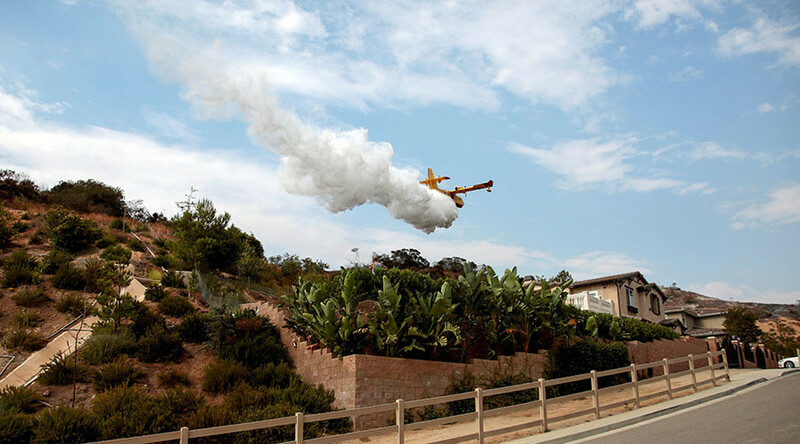 A Los Angeles police chief is warning people they are putting city firefighters at risk by sending drones over areas where low flying aircraft are battling the La Tuna wildfires. The outbreak of brush fires in La Tuna Canyon, Los Angeles, has caused more than 6,000 thousand acres of land to be destroyed since Friday. Favorable weather conditions have allowed the city to recently lift evacuation orders and the Los Angeles Fire Department reported on Sunday night that 30 per cent of the fires have been contained with the help of air support. Despite some headway, images posted on social media show fires still raging. A spokesperson from the local Burbank Police Department has now warned that people face arrest if they are caught flying a drone near wildfire hit zones. The caution comes after a drone reportedly impeded fire fighting operations at the Cabrini Villas, near to Verdugo Mountain Park. “I cannot stress how dangerous [flying drones] is. We have low flying aircraft that are attacking this fire and flying a drone near a fire is extremely dangerous. It can result in catastrophic consequences,” Sergeant Derek Green said in a Facebook video. He added that personnel are now on patrol to tackle the unexpected intrusion. More than 1,000 Los Angeles Fire Department (LAFD) personnel have been involved in battling the LA infernos since California Governor Jerry Brown declared a state of emergency on September 1. Some nine LAFD helicopters have been used in the emergency.